Signage at the SGX building on Shenton Way in Singapore; taken October 2018. This article was originally published on Tuesday, 12 February 2019 at 21:35 SGT; it has since been updated to add Perennial Real Estate, Yoma Strategic and Far East Hospitality Trust. Hutchison Port Holdings Trust, or HPHT, reported on Tuesday a fourth quarter net loss of HK$12.11 billion (S$2.10 billion or US$1.54 billion), swinging from a year-earlier net profit of HK$237.8 million on impairments related to trade tensions. Perennial Real Estate reported on Wednesday that its fourth quarter net profit fell 42 percent on-year to S$16.0 million, mainly on higher finance costs. Far East Hospitality Trust reported on Wednesday that its fourth quarter net property income increased 13.9 percent on-year to S$26.32 million, in line with analyst forecasts, amid a turnaround in hotel performance. Singapore Exchange said on Tuesday that its total securities market turnover value for January was S$21.7 billion, up 29 percent on-month, but down 26 percent on-year over 22 trading days. December 2018 had 20 trading days and January 2018 had 22, it said. The securities daily average value (SDAV) was S$986 million, up 18 percent on-month, but down 26 percent on-year, it said. Total derivatives volume was 18.61 million for January, up 1 percent on-month and up 3 percent on-year, it said. 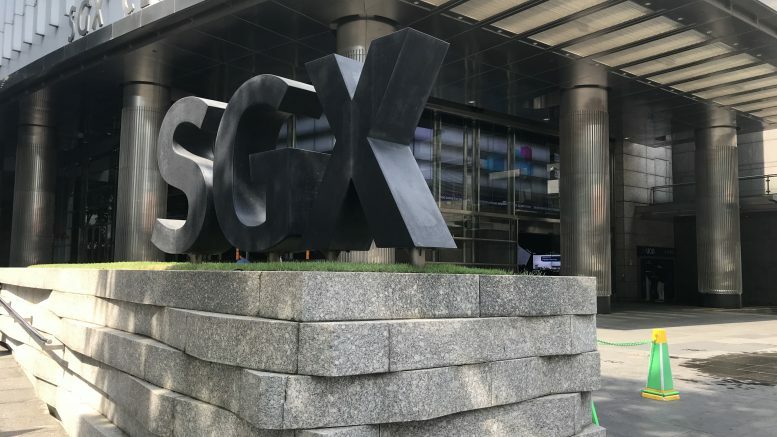 SGX Commodities Derivatives volume was 2.04 million in the month, up 60 percent on-month and up 52 percent on-year, reaching its highest level since November 2016, it said. Read more about Singapore Exchange here. Keppel Infrastructure Trust said on Tuesday that it obtained a S$750 million term loan facility. If Keppel Capital Holdings ceases to own all of the trustee-manager, Keppel Infrastructure Fund Management, the facility will be canceled and it will need to be repaid, it said. SBS Transit reported on Tuesday that its full-year net profit jumped 70.0 percent on-year to S$80.10 million amid higher rail ridership and bus mileage. Yoma Strategic reported on Wednesday a fiscal third quarter net loss of S$5.2 million, swinging from a year-earlier net profit of S$18.8 million amid higher expenses to support growth of its new businesses. Singapore-style coffee shop operator Kimly reported on Tuesday its fiscal first quarter net profit fell 8.2 percent on-year to S$5.3 million despite increased revenue as costs rose. Boustead Projects said on Tuesday that its fiscal third quarter net profit fell 15 percent on-year to S$6.8 million, mainly on slightly lower gross margins on ongoing projects, lower cost savings from projects previously completed and as the share of loss from associated companies and joint ventures more than doubled to S$2.85 million. “In addition, the newly completed ALICE@Mediapolis, where leasing is still in progress, has started to incur depreciation expenses,” it said. Revenue for the quarter ended 31 December incrased 70 percent on-year to S$81.3 million on higher design-and-build revenue, partially offset by lower real estate revenue as the lease expired at 85 Tuas South Avenue 1, the company said in a filing to SGX after the market close on Tuesday. Read more about Boustead Projects here. Singapore Myanmar Investco reported on Tuesday that its fiscal third quarter net loss widened to US$1.25 million, from US$432,000 in the year-ago period. Revenue for the quarter ended 31 December fell 16.6 percent on-year to US$549 million, it said in a filing to SGX after the market close on Tuesday. Read more about Singapore Myanmar Investco here. Hiap Seng Engineering reported on Tuesday a fiscal third quarter net profit of S$2.87 million, swinging from a year-ago loss of S$7.0 million. Turnover for the quarter ended 31 December more than doubled to S$52.40 million on higher revenue recognition, it said in a filing to SGX after the market close on Tuesday. “As the environment for the oil-and-gas industry continues to remain challenging in the near term, the directors of the company will continue to seek suitable opportunities in new markets to mitigate any slowdown in the oil-and-gas sector of the traditional markets,” Hiap Seng said in its outlook. Read more about Hiap Seng Engineering here.